Are you interested in having your son or daughter become a junior member of Flourtown Country Club? As a junior member of Flourtown Country Club, not only do you have access to our beautifully manicured 9 hole golf course, but you can enjoy an affordable membership for your junior golfer, a parent/guardian, or the whole family. 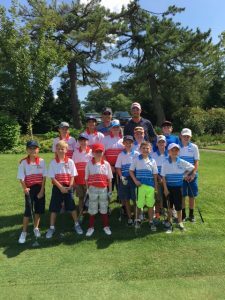 PGA Junior League Golf (PGA JLG) is designed to better socialize the game for boys and girls, ages 12 and under. PGA JLG features team vs. team competitions in structured leagues that provide a popular, less stressful scramble format as opposed to stroke-play competition. This is a great way to get kids involved in the game. For more information about the league, please visit http://www.pgajrleaguegolf.com/. Flourtown Country Club’s Junior Golf camp is taught by our Golf Professional, Gerry Davis, and his staff. All registrations for camp are through Springfield Township Parks and Recreation. No signups at Flourtown Country Club. Contact the township at 215-836-7600.